Some of the finest bourbons I have ever had the pleasure to taste were examples of Four Roses Single Barrel. Paul Pacult poured a Four Roses single barrel selection at an event called "The 10 Greatest Spirits in the World" back in 2008. It was, specifically Warehouse CS, barrel #48-SP. To say it was a highlight experience would be putting it mildly. Later I acquired a single barrel bottle from barrel 22-1B, warehouse BN, bottled at 53.6% using recipe OBSQ which was a single barrel limited edition selection for Park Avenue Liquors. I gave it 5 stars in my review and called it "cognac-like". A couple of weeks ago at Whiskey Live NY I had the opportunity to try the Limited Edition 2012 Single Cask, recipe OESK, 52.5% abv. (briefly mentioned in this post). This one might be the best of all of them. However, when you look in most liquor stores, the Four Roses Single Barrel offering you'll find is a much less expensive lower proof (50% abv) version with a bottle that has a less shiny label and a leather-looking strap at the neck. This version costs a lot less; $31.99 at Shopper's Vineyard currently. The others cost more - often multiples of that. Is this "standard edition" of a piece with the amazing ones? They all have the pyramidal trapezoid bottle; but do they share the ability to wow? 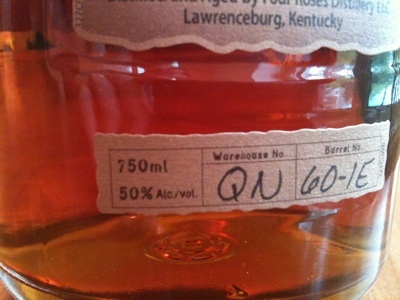 To see I got one of those Shopper's Vineyard bottles, specifically Warehouse QN Barrel 60-1E 50% abv. I e-mailed Four Roses and asked "what recipe mash bill and yeast this barrel used. OBSV?" Nose: first and foremost sandalwood perfume, then bitter citrus, peach, caramel and some spicy green herbal notes like thyme flowers or oregano blooms. There is also some rich sweet bacon deep in the back. This is a big perfumed fragrant and appetizing nose. I could sniff this for hours... (in fact, that's exactly what I'm doing). Entry is sweet like powdered demerara. The expansion is peppery, bold, herbal, juicy with orange marmalade and canned peaches and effusively wooded in the best and most fragrant way. The sandalwood essence carries directly from the nose, through the sweet entry into the powerfully wooded midpalate and out into the long glorious and drying finish with gentle tannins and echoes of charred oak. The signature of the high rye mash bill is all over, from the vibrancy and sweetness in the nose to the effervescent fizzy spice and big kick in the midpalate and the sweet herbal notes all over. This is a triumphant American sipping bourbon. I know it seems like I've been giving every bourbon five stars lately. Am I just easy on bourbon, or am I just very choosy in selecting which bourbons to review? My last review was for Rock Hill Farms, another high rye mash bill bourbon. Rock Hill is more dry and austere - a bit more refined and noble. Four Roses 100 proof Single Barrel is more juicy, fruity and full - but no less satisfying. So, given that the Four Roses is 1/3 less expensive is Rock Hill worth it? Yes. What about those more expensive limited edition Four Roses single barrel selections? Are they worth the extra money? Yes. Each of these items has its own unique mix of attributes. They all provide tremendous enjoyment all offer excellent value - especially compared to other spirits such as Scotch, Irish, Canadian, and Cognac. Is the "standard edition" Four Roses Single Barrel 100 proof an awesome value - absolutely. It is a landmark product in my opinion in the value for the money equation. The other standout value in bourbons is Elijah Craig 12. EC12 is almost 1/3rd again less expensive than Four Roses Single Barrel 100 proof. It's a different animal, however, with it's high corn mash bill and longer barrel aging. It's softer, fruitier, more dank and dark, and more densely wooded. 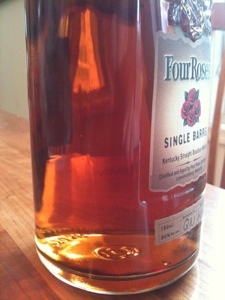 The Four Roses Single Barrel has more punch and zest and more herbal notes because of the rye. They share the wonderful sandalwood perfume. Do what I did and get both. They are both permanent additions to my cabinet and a great gift to bring to others. Their single barrel whiskies are just fantastic. Even quite a number of drams in, it was a standout when I got to taste it at a distiller's event here in Portland last year. I wish my palate had been cleaner when I also got to try their 2011 Limited Edition whiskey, but such is life. Hilariously, the private bottling Four Roses Single Barrel editions that a few of the liquor stores here in Portland have brought in are actually cheaper than the regular, lower proof FR SB editions here in Oregon. Not going to complain because I picked up an OESO that I'm really looking forward to opening. Rye spice and fruit are a match made in heaven. It would be really great if FR would release a mini ten pack with all of their different recipes. Given the breadth, I'm guessing there would be a lot of interest in something like that. Just buying full bottles when they crop up is tempting, but that's an awful lot of cask strength bourbon to get through. I'm with you guys. I had my first taste of FRSB last weekend, and after one dram I pretty much elevated it to cabinet staple status. It seems like an every-mood bourbon. Good enough to hold its own with any spirit, yet also relaxed enough (and cheap enough) that you can just chill-out with a glass too. I don't have access to any other recipes here in PA, except for the yearly limited edition. $80 is a tough sell for me though to try a different recipe. I don't think it's something I would ever buy for myself, but I might ask for a gift or something. I'm totally with you, though, that it would be great to get a recipe sampler-pack! Is this anything like Old Grand Dad? Old Grand Dad is a high rye mash bill bourbon - and some of the same flavor notes. However, Four Roses Single Barrel has a greater density of flavor - particularly on the mid palate - as well as more complexity. It just comes across as a fuller flavored, more delicious pour for sipping slowly neat. If I were making Manhattans for a crowd I wouldn't hesitate to save a few bucks and get the Old Grand Dad (a superb base for Manhattans). 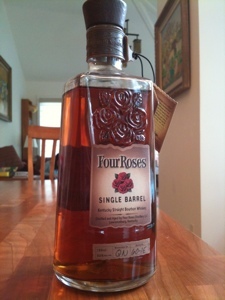 Sipping neat, however, springing the extra money for Four Roses Single Barrel is HIGHLY recommended. I meant more on the big dose of barrel char back plate like Old Grand Dad. I asked Sourmashmanifesto and he said No except the fruity side. I notice Dickel 12 has all that soft barrel char back palate too except a much different flavour. I stumbled on your site while searching for the formula used for 100 proof FR-single barrel. Rediscovered bourbon this past summer on a visit to Buffalo Trace in KY and have been buying everything I can find that Jason Pyle at SourMashManifesto rates at 8.8 and above because it seems my taste is very similar to his. I have been choosing which bourbons are my personal favorites and am BLOWN AWAY to see you listing 3 of my 4 top bourbons from a nearly 40 bottles here: Four Roses Single Barrel, Rock Hill Farms, and Elijah Craig 12. Then searched for my 4th fav, Booker's and your experience matches mine exactly! Thanks for sharing your experiences with some of life's most sensual pleasures!